A while back I painted a dresser. This dresser had been hanging out in a stack of furniture in the back room at Vera's Daughter. I had been wanting to paint it for months. I had this vision for a pale yellow underneath lavender. 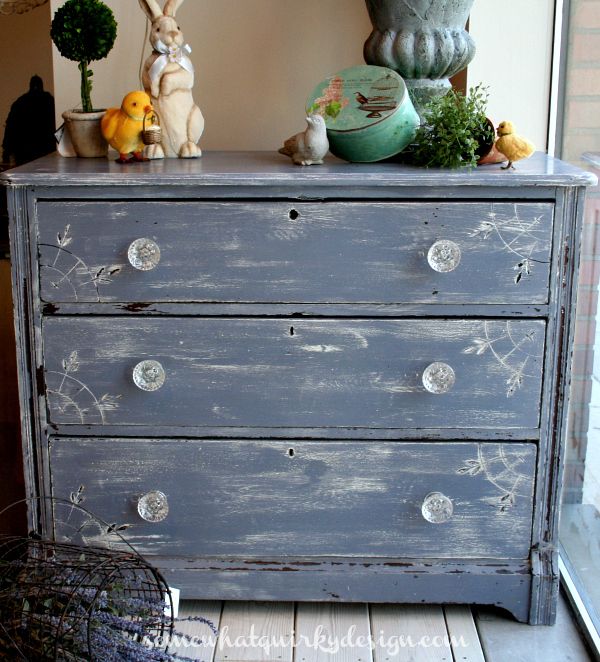 Becky, the owner of Vera's Daughter is a Miss Mustard Seed Milk Paint dealer and teacher. We agreed that I could get the look I want using Linen underneath Dried Lavender. Based on Becky's training and experience and my reading and experience, we decided to use 2 coats of Linen with Bonding Agent for the base coat and one coat of Dried Lavender with no Bonding Agent so that the Dried Lavender would be easy to sand back. I DID sand the entire piece prior to painting - you know, because I prefer sanding to washing. I painted the entire piece twice with the Linen mix and left it overnight - maybe 12 - 18 hours. I used a bit of Hemp Oil in spots - along some edges and random spots over the dresser to provide a resist to the Dried Lavender paint. I also used a small paint brush and dabbed a bit of Hemp Oil into the carved areas on the front of each drawer. That was the last thing that went well. 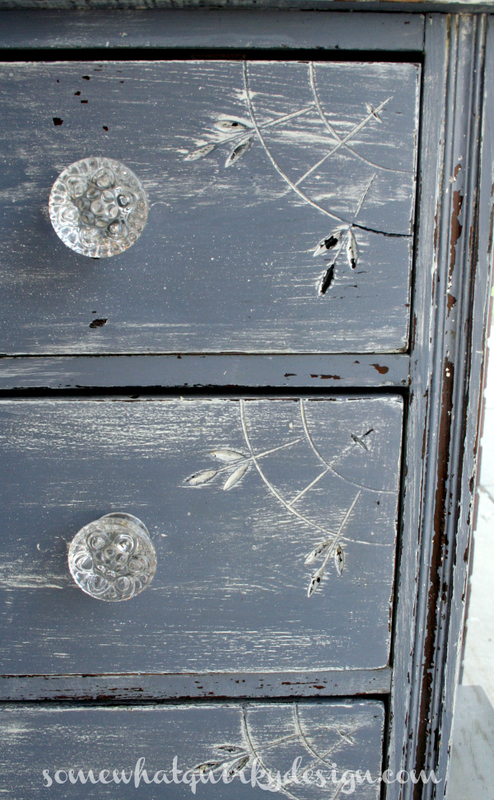 Remember how they say that milk paint has a mind of its own? Even when you do every. single. thing. that all the educators say you should do. I painted the entire piece with the Dried Lavender. Two things happened that I did not like. First, the Linen paint in the carved areas on the drawers - where I had applied the Hemp Oil as a resist - pulled away and flaked off in a several places. This was disappointing because my entire vision of the piece was based on the Linen paint showing through in the carved areas. 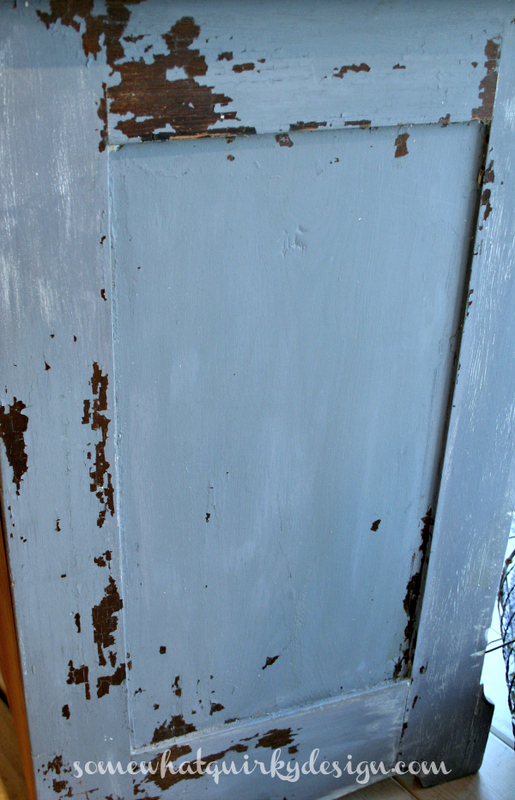 Second, huge - and I mean HUGE - sheets of all three layers of paint, even the ones with Bonding Agent, were peeling off of the side panels of the dresser and falling in the floor. So I did want a little chipping, or even a lot of chipping, but I didn't want the entire side panel of the dresser too fall off. Argh. So each time a big panel would fall off I would peel off all the loose areas, sand them, then paint them with Dried Lavender. I did this like 40 times, or until I thought that enough of the side panels were covered, or at least mostly covered, with paint. 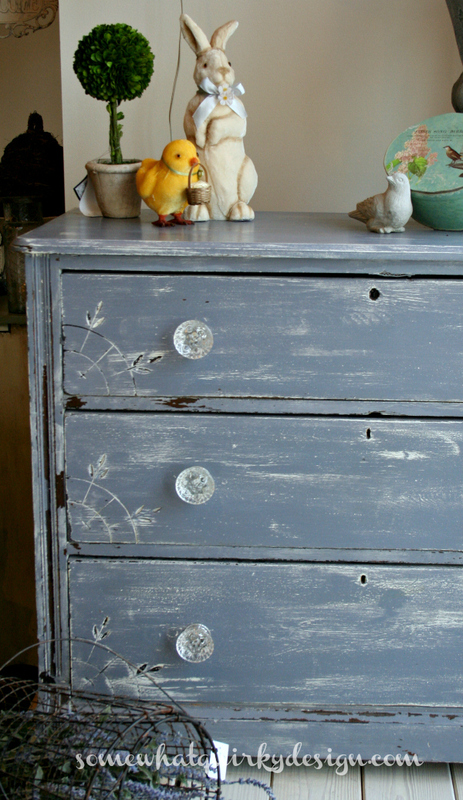 When the paint was dry and no longer falling off in sheets, I sanded the rest of the dresser - the top and the drawers. I sanded and sanded and sanded and sanded. I wanted a lot of the Linen to show through. But alas, it did not. What I got was going to have to be good enough. I covered the entire piece with Hemp Oil. Then I left the store. That was on a Saturday. When Becky came back to the store on the following Wednesday all the parts of the side panel that hadn't previously peeled off were laying in the floor. Eventually she decided to paint the side panels with the closest match she had in her Paint Couture line. So the side panels are actually blue. But it blends pretty good. And the side panels are no longer shedding paint onto the floor. It is likely that we will eventually put another coat of Dried Lavender over the "very close to Dried Lavender" blue that is now there. Could I just say that I really like the way it looks? Especially with these way cool knobs from Hobby Lobby. Something else. If I were going to do this again - which I might - I would lightly sand the under layer of paint before I put the top color on. My paint mix was smooth as silk, but still there was a slightly grainy or sandy finish on the piece. When I sanded away the top layer you get a "dotted" effect where the grains of pigment (or filler) were. I really believe that if I had sanded prior to putting on the second color this would not have happened. I really need to try this whole process again to find out if I am right. I hope I am. I like to be right! I would also sand much more aggressively on the side panels initially. Those panels are not always the same quality or type of wood that the rest of the dresser is made from. Other than that, I'm not really sure what I would do. It appears that the "wetness" of the top layer of paint was what caused the paint to peel away. There was no peeling or chipping of the paint prior to putting on the third layer of paint. I would also consider not using the under layer of paint on the side panels - just painting the top color on the sides. I can only hope that someone loves it just like it is and takes it home to live with them. UPDATE: MMS has updated their teaching that you only have to use bonding agent on the bottom coat. That is not true. If you use it once you have to use it all the way through the project. That is why we had the huge paint falling off in sheets issue on the sides of this piece. So if you use bonding agent in the bottom coat, use it in every coat. Done. I think it looks terrific Karen! Despite all the inperfections and flaking --- it looks wonderful and aged. 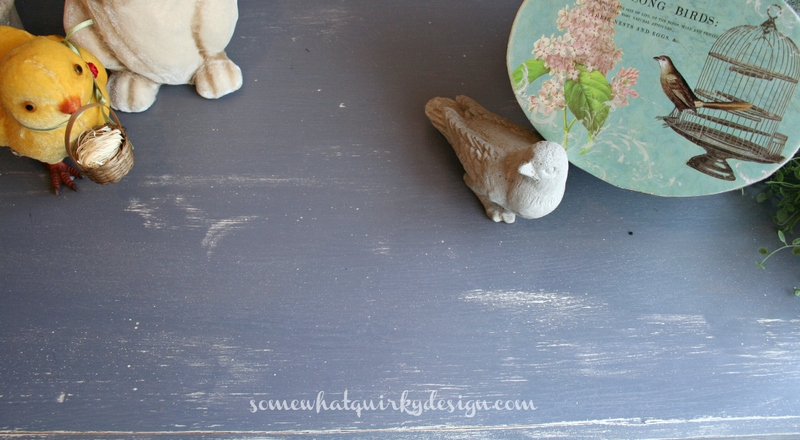 I have never used milk paint...for alot of those reasons. Knowing me, I would probably chuck whatever started peeling, and we don't need that. your piece looks good though and I hope it does find a new home soon. Sounds like an ordeal...and I appreciate your candor about the process. I like it just as it is! Yes, I would buy!!! I know what you mean about paint. You just never know what you're going to get. I think it's pretty, though! Although it sounds like a real ordeal, it turned out really well. 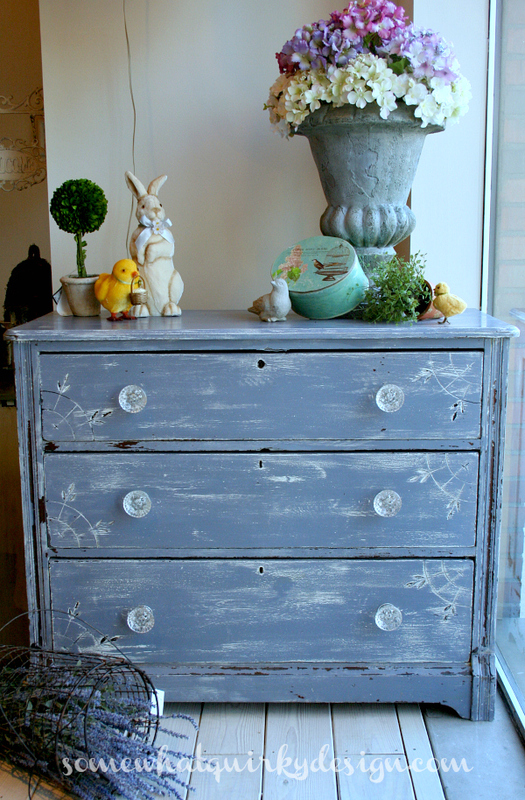 I love the detail on the drawers, the colour and the knobs. I'm sure it'll sell. Wow, Karen. You put a lot of effort into this piece to have the paint peeling off that much. I wonder if someone had oiled that piece at one time and that's why the paint would not stick. We never know what a piece has experienced before we get it. 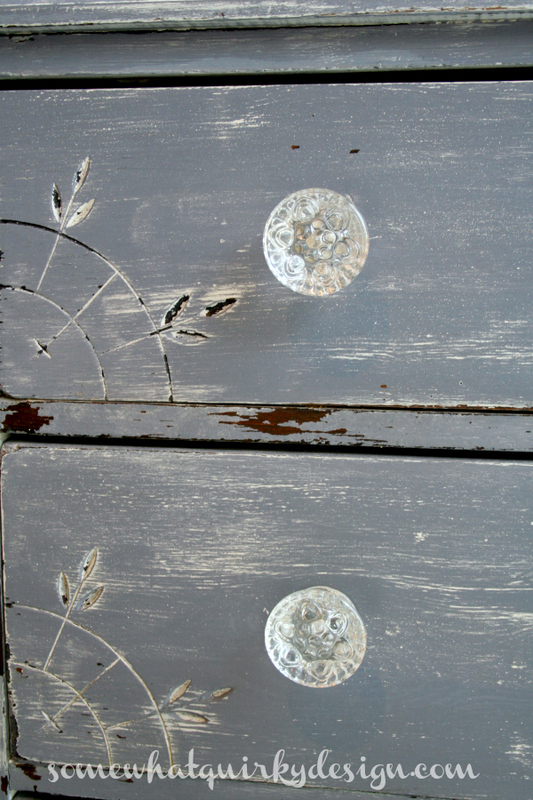 I just bought some MMS milk paint and will be trying it on a new piece very soon. I'll let you know if I have any problems with it. Maybe if you had used deglosser it would have held the paint. However, I think your dresser is beautiful as it is. I have found deglosser to be very helpful! !